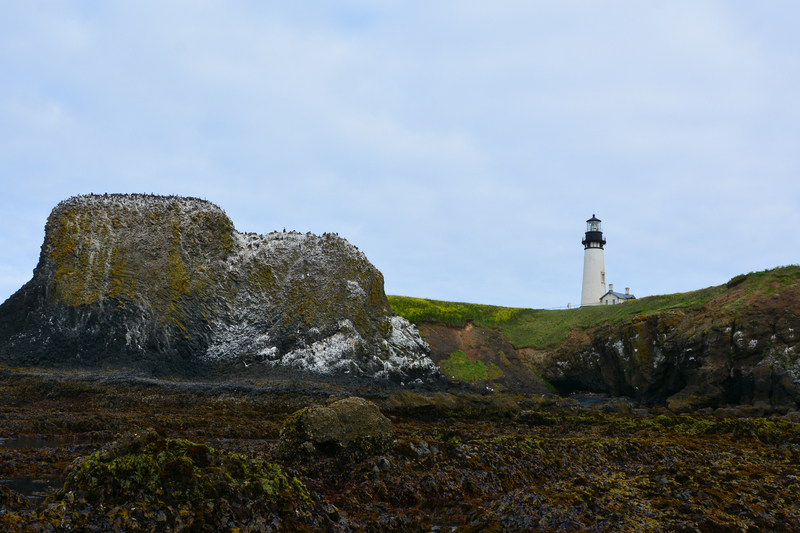 as our Oregon Master Naturalist class discovered when we investigated the Rocky Shores found at Yaquina Head near Newport, Oregon. At first glance, most would gaze upon the rocky shoreline and recognize a lot is going on. That’s a BIG question… but, easily answered with the assistance of a set of Nature Guidebooks. These two questions are more complex. They require us to analyze the environment, and to evaluate how needs for survival are met in the habitat zones located along the rocky shores. Fortunately, our cadre had skilled instructors from diverse backgrounds who showed us how to look at the edge of the sea with the literal and critical thinking skills necessary for seeking out the answers to all three questions. Understanding why the plants and animals lived where they did, and how they were able to survive in a particular habitat zone made sense. 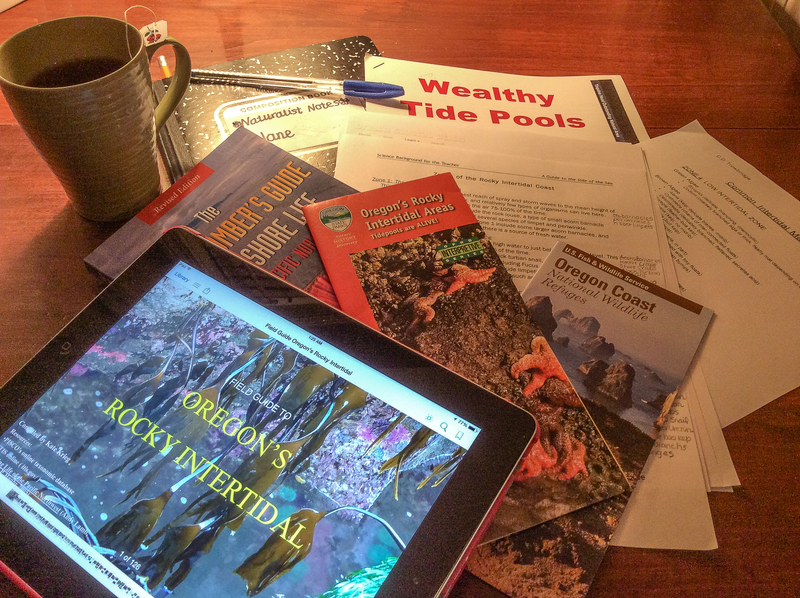 Cynthia Trowbridge, Ph.D., Senior Research Associate, Oregon Institute of Marine Biology, was an impressively knowledgable instructor who helped me to bridge those understandings with information she shared on the beach and in the classroom. Where I stumbled a bit was on the identification of all the Rocky Shores flora and fauna! Time to pull out the nature guide books, and to find some helpful websites. It’s no surprise that only the hardy live in the Spray Zone! fresh water washes down your rock face during times of rain and occasionally snow. The combined result of all these factors is desiccation. Only organisms that have adapted mechanisms to prevent the effects of extreme drying can survive here. Although there can be large numbers of individuals, the Spray Zone supports fewer species than other zones. Some of the organisms I observed are pictured above. See if you can identify them. Check your thoughts by running your mouse over the photo. Comment from C. Trowbridge: SeaweedGreat photo! 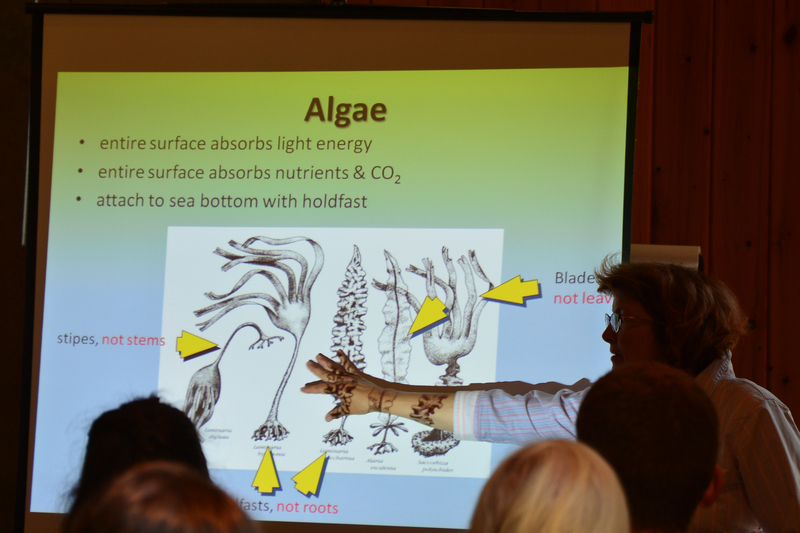 The brown alga is actually a kelp (Egregia menziesii) rather than a rockweed. The red alga below it is the test-tube brush alga (Neorhodomela larix) which contains high levels of bromophenolic compounds for chemical defense. Rockweed, Nail Brush Seaweed Comment from C.Trowbridge:Amazing photo! 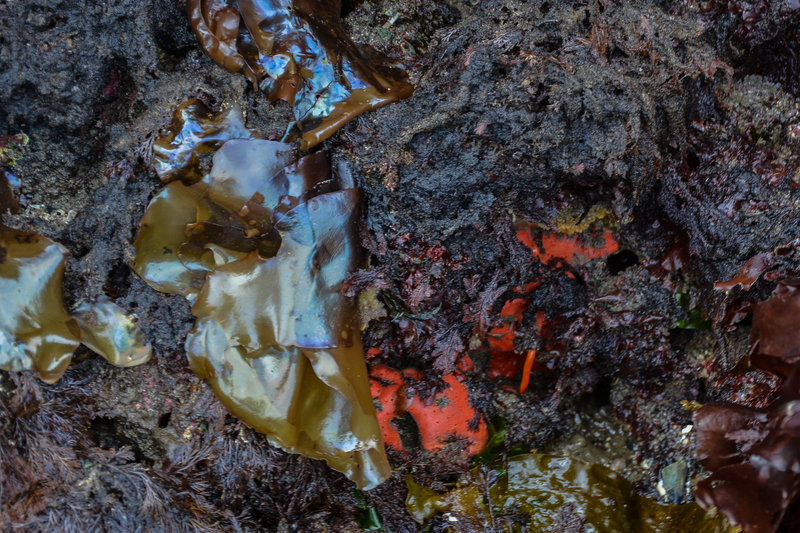 In addition to the rockweed (Fucus, bottom) and test-tube brush red alga (left), there is a sea anemone (top middle), pot scrubber alga (top right), and 3 other red algae in the image. Zone 2 is exposed to the air about 35% to 75% of the time. Flora and Fauna that dwell here also experience harsh changes in temperature, salinity, and availability of water. In addition, animals and plants must attach themselves securely to the rocks to survive wave action. Dire Whelk, Blue Top-snail, Black Turban Snail, Grainhand Hermit Crab Comment from C. Trowbridge:Dire whelks are feeding on an ochre sea star that died of the wasting disease. Urchin test, Giant Green Anemone Comment from C. Trowbridge:The sea urchin skeleton is called a “test” [always hilarious to students]. Rather than being an exoskeleton or carapace, it is internal — the bumps on the outside are where spines articulate (ball-and-socket attachment) and the entire outside is covered with epidermis (skin). 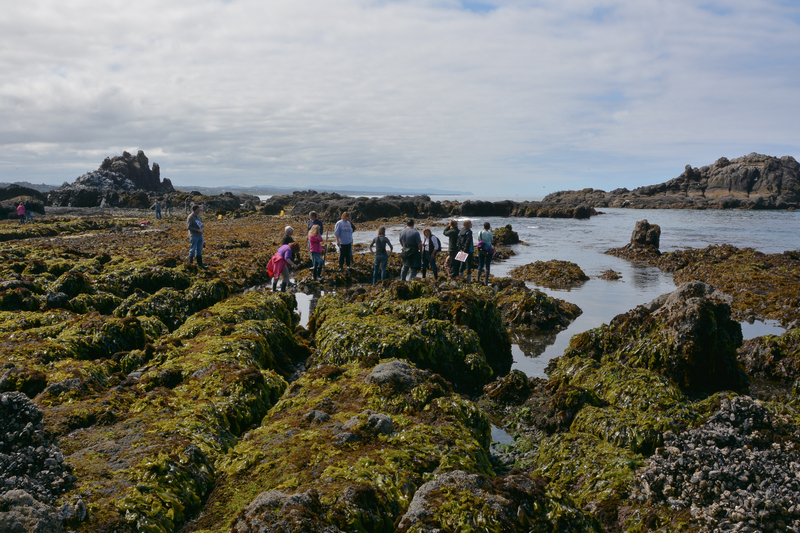 In the Middle Intertidal Zone, tides cover and uncover the plants and animals about twice a day. Changes in temperature and salinity are less severe than in zones one and two. It is exposed to the air about 7% to 35% of the time. Many animals here depend on the tides to carry food to them. 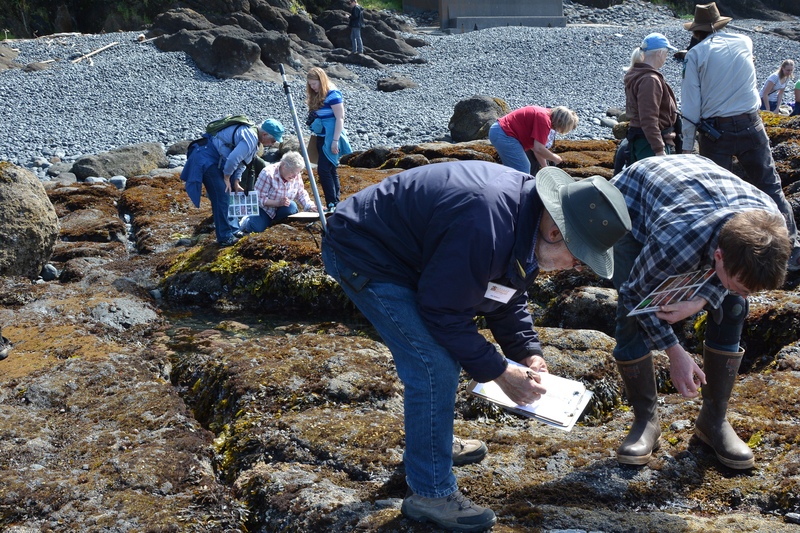 In a healthy Middle Intertidal area, the zone is rich in diversity and numbers of organisms. Dense covers of algae provide food and shelter for many of the animals. Orange Sea Cucumber amid Purple Urchins, Comment from C. Trowbridge: Anemone is a juvenile brooding anemone. Also, note the fission worms (polychaetes) in the top center. Stuck? Look in area around lower left arm near the rock. You will need to look very carefully, but I assure you, there is a sculpin in each of these photos. Organisms in the Low Intertidal Zone are fortunate to have water cover most of the time. The zone is exposed to air only at the lowest tides… about 9% of the time. Most plants and animals here can only survive short periods of time out of the water. Temperature and salinity changes are much less severe. 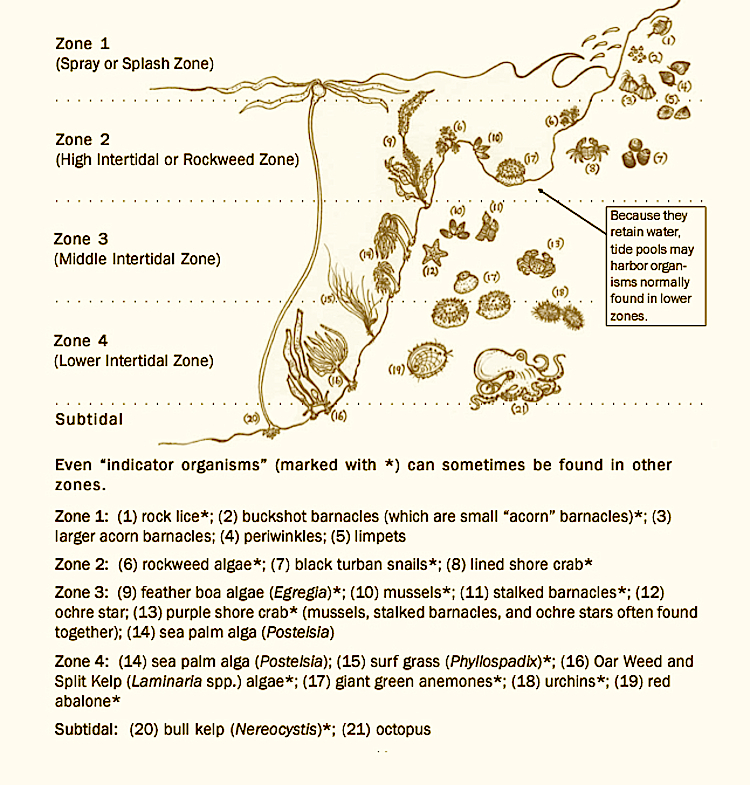 More organisms are found in the Low Intertidal Zone than in any other of the zones. I add this category as a way to include the birds and mammals that rely on the Rocky Shore environment to meet some of their needs for survival. Test your observation skills in the last two photos. See if you can find the mother seal with her newly born pup… the baby still has its umbilical cord visible. Never stop looking… you never now what wonders await for those who stop to watch at the edge of the sea. As a child, we often vacationed on the New Jersey shore. My favorite place was Cape May Point because it, then, still seemed on the natural side. After moving to Oregon 45 years ago… I can’t imagine ever leaving the amazing Oregon Coast. We were fortunate to have had visionary legislation that made the coastline public lands… Good for us and, more importantly, the natural systems that depend on it. I join you in your remorse about the condition of ecosystems as they exhibit the effects of human activities.I wish I could say our ecosystems out here are functioning perfectly, but they, too, are burdened. What we are currently seeing is the effect of upwelled waters that cause ocean acidification- not a good thing for shellfish like oysters and mussels. Scientists are also very puzzled by the Sea Star Wasting syndrome that is rampant from Alaska to California. What we have working in our favor is that many of the tidal areas and estuaries are not as populated as they are on the East Coast… that helps with plans for remediation. The Oregon Coast IS an amazing place and many folks deeply care about its past, present,and future! What part of the Coast does your grand daughter live? Thank you for following Forest Garden today 😉 I’m looking forward to getting to know you better through these chats. However, ocean acidification has been a known problem since about 2007 when the oyster hatcheries started to have problems. High CO2 levels in up-welled waters are the problem. Interestingly, the culprit carbon emissions are those that accumulated and sank into the Pacific 50 years ago. Seems to me, there are environmental problems anywhere humans have had impact. A global crisis we all must address in little to big ways… from the Chesapeake to the Tillamook. My impression is that the acidification is driven by varying ocean dynamics depending on location. Off the Oregon Coast the upwelling causation was primarily ocean current driven… connected with the El Nino, La Nina effects… but I can’t describe how those function! I hope you won’t mind me sharing links… this one for NOAA’s “What is Ocean Acidification?” just kept me engaged for the last half hour or so. The video and story map – Ocean Acidification Around the World- were very informative and “easy” to understand. I agree with you, little things do matter, because they all add up! Awesome… thank you for this excellent post! FYI- There is sea star wasting disease observed at Yaquina Head. Observing first hand is a distressing feeling, posting the photos only deepens that feeling. Understood… the total absence of the bright color of sea stars down here is somber. You clearly went to considerable effort in photographing this excursion, and as well the literary illumination is greatly appreciated, it has filled in a lot of gaps of mine own knowledge. Tube worms and purple sea urchins can be seen close at hand in tide pools at the Strawberry Hill beach access, just south of Cape Perpetua. North from the turn out, up the beach at low tide and on top of the furthest accessible lava fingers are pools which offer good observation. I am so grateful to have the photos… I missed a lot of species at the my first observations made on site. Cynthia Trowbridge left so many helpful comments after my initial efforts to identify species! The tube worms escaped my eye… not knowing what to watch for. Now I can understand what you are describing down your way. Tube worms are very sensitive to vibration and shadow over the pool, one has to stay low and move slow approaching the pools edge. Chinook RV Park up the Alsea River 3 miles from Waldport is neat and tidy, they’re good folks and usually have a space available. Excellent tip… don’t know if my photos captured the maximum possibility then! Thanks, Jane! A lot of work involved on your part but what a nice summary of the day. Really appreciate it! You are very welcome! It was a pleasure to take the photos and share the summary of the day. Hooray for rocky shores!! I love these photos – the mid-intertidal zone was a major focus of my dissertation (especially the Purple Ochre Sea Star and mussels). I miss the beauty and hidden “treasures” of tide-pooling. You got some great photos of the diversity that resides there! I’m happy the photos took you along on to your favorite place! Agreed… there is SO much diversity. That’s where I’m grateful to have the photos to “freeze” things for a longer look. I had to laugh at myself – the sculpin in the urchin and sea star observations totally eluded me until I discovered him during photo editing!! I was wondering who the lady with the camera was! Verrrry Cool. I have not seen your blog before, so will have some fun with it soon. See you at graduation?! Yes, that was me! I loved putting the camera to work during our field studies. What an enlightening experience each class turned out to be… having the photos helps me to remember things better. I do hope you will come back to the blog. It’s fun to have these little conversations with others. Hoping to be at graduation… however… our first grandchild is due right about that time. She will have preference!!!!!! I’m so happy you are inspired! Just have your camera handy and take LOTS of photographs… then play around with editing for improving composition with cropping, etc. I usually use Lightroom 5. I started with Aperature, but now tend to lean more towards the Lightroom features. I’d love to see your photography. Email me links when you get your project off the ground. I’m an amateur at this and learn a lot through trial and error, but if I can be of help… please let me know. Informative post, Jane. Really enjoyed reading it, as coincidentally have been gathering pictures with the same subject in mind. Am a fan of Rachel Carson’s writing too :). It’s interesting to note the similarity of species – here on the Cape Peninsula the coastline is tempered by two ocean currents, making for a range of sea flora/ fauna. Was chuffed to see that nudibranch and also what looks to be a sea hare? Wonderful to see such a rich tidal edge through your galley of photos. I’ve admired Rachel Carson ever since I was a little girl… I still have my “child’s” edition of “The Sea Around Us” that Santa brought for me when I was ten years old. At the time, my dream was to be a marine biologist when I grew up! I look forward to your rocky shores photos from the Cape Peninsula! I’m going back to the photo of nudibranch to see if I can spot a sea hare. That’s the amazing part of photography- the ability to look again, and to continue finding more in the richness of the diversity in species. What an inspiration she was to so many! And influential – her ‘ Silent Spring’ ignited the environmentalist movement . I’m travelling for the next couple of weeks, so rock pools and the intertidal zone must wait until I return home again. The words and photos are so informative, interesting, and enlightening!! Wow! I’m so delighted you enjoyed the post. Thank you for your kind words. Thank you, Jane, for those fantastic photos and the lesson that came with them. Baby seal’s position looks a bit precarious if a decent wave comes along! So happy you enjoyed the post. I agree with you, the way seals position themselves on the rocky shores does seem troubling to the human eye. I suppose we are left to trust the ways of nature… tampering “to save them” often goes more wrong than right. A thought that crossed my mind was how little time the mother seal and pup had to rest and recover before the tides would come in. Then your observation most certainly is a factor.